When Charisse was younger, her mother would have her and her siblings check on the seniors in their neighborhood, running to the grocery store, taking out the trash and helping with the day to day chores. Charisse decided to sign up for Goodwill's Certified Nurse Assistant (CNA) course so she could put her caretaking skills to work. "It was something I was just really interested in," Charisse shared. "I have taken care of older people, but I wasn't certified. I think the certification is necessary if you want to do the best. Not only as far as pay goes, but also the knowledge that you gain through going through the class and getting clinical skills." Every year, Goodwill helps thousands of individuals like Charisse train for and find the job they want in East Tennessee. Our work is made possible thanks to our donors and shoppers; when you support Goodwill, you directly support people working to changing their lives. In addition to the 6-week Certified Nurse Assistant class, Goodwill provides computer training, free career planning and paid work experience for young adults, job readiness training and more. Our program participants receive the support they need to enter the workforce or move further in their careers. 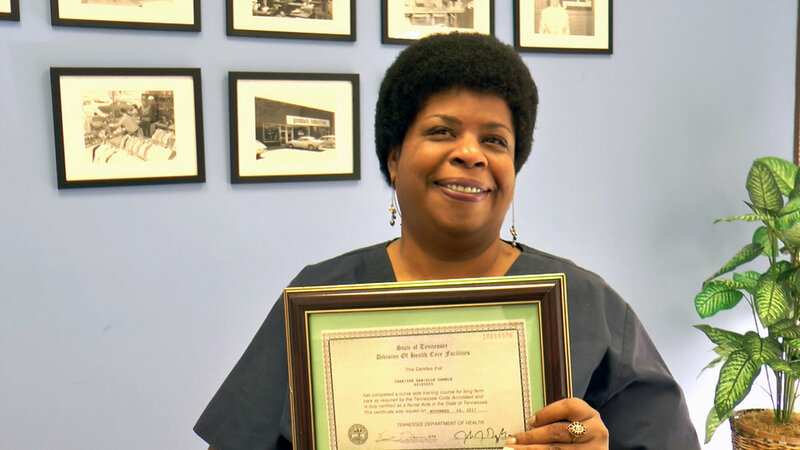 Charisse is proud of her CNA certificate that she earned in November. "I could have continued working and not been certified, but with the certification, I know exactly what I'm doing and what needs to be done," she said. "I'm just glad it gives me options." Giving the gift of empowerment this holiday season is as easy as donating items you no longer need. Change a life. Give Goodwill.